Motorcycle Cannonball: Day Three | Hupy and Abraham, S.C. The morning air was cool and foggy as the riders headed out into the narrow winding West Virginia back roads. Today we only received eight pages of typed driving instructions instead of the 12 pages we got on day one and the 13 pages for day two. It looks like the hills won’t be so steep on this leg of the journey. Elevations will range from 500 to 1500 feet. 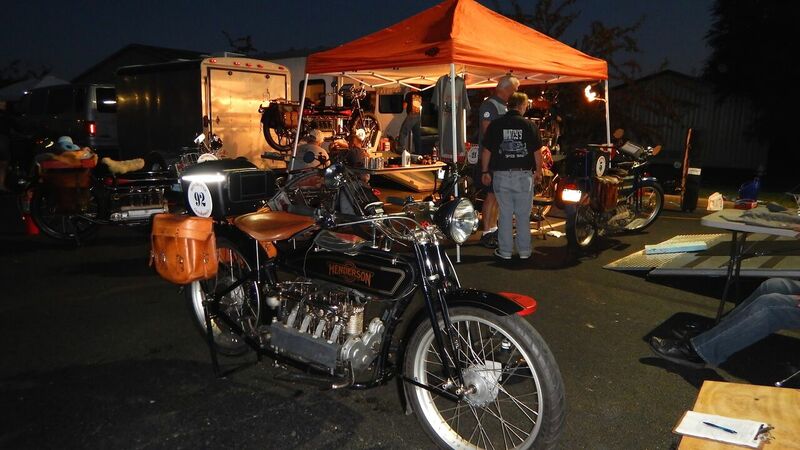 The course is 218 miles with a hosted lunch stop at S&P Harley Davidson in Williamstown, WV. The riders were happy to be on the road again after a too brief night of rest. Several of the riders stayed with their crews to help work on their bikes. I was on the course for approximately 12 miles before I saw the first bike pulled over. I helped the rider figure out our location, and continued on my way. I find it amusing that I can smell the tell-tale odor of spent fuel and hot oil before I actually see the rider. The fog had lifted and the sun was rapidly warming the air when I saw Kelly Modlin, #24 at mile marker 36 in the shade of a semi-trailer being used as a billboard. Just two miles further, Joseph Gimble, #8 was pulled over waiting for his bike to cool down before completing an ascent on a hill. As I continued, scanning for more stopped riders, I pondered how difficult this ride is on both rider and machine. I wondered what it must have been like many years ago when people first attempted long distance rides like this. Today we have many paved roads and we stay in hotels. We have chase vehicles and support staff. Perhaps we only heard about the successful cross country ventures of days past, and I wondered how many unsuccessful attempts there were. I was jarred back to reality when I saw Rich Rau, #94 from Oregon at mile marker 52, and just a bit further, Herbert Ullrich from Germany, #61 at mile marker 56. Ullrich was finishing a repair to his bike to the enjoyment of a couple of locals who were excited about having this visitor in their neighborhood. Repairs finished, we watched him ride off as I explained what the Motorcycle Cannonball is. I pulled into our lunch stop hosted by a local dealership amid a fury of activity. Parking attendants directed the vintage iron to select spots as spectators cheered each arrival. People were talking about a crazy guy who pulled into the lot going a little too fast and ran off the pavement into the bushes. I asked them to point out the bike and I laughed. It was just Doug Feinsod, #18 from California on his Thor. He’s kind of like that; Energetic, maybe a bit too zealous, and always a crowd pleaser. Fortunately he wasn’t hurt. S&P Harley Davidson put on a good spread for lunch and the support crews and riders gathered at one table to share stories of the day’s adventure. 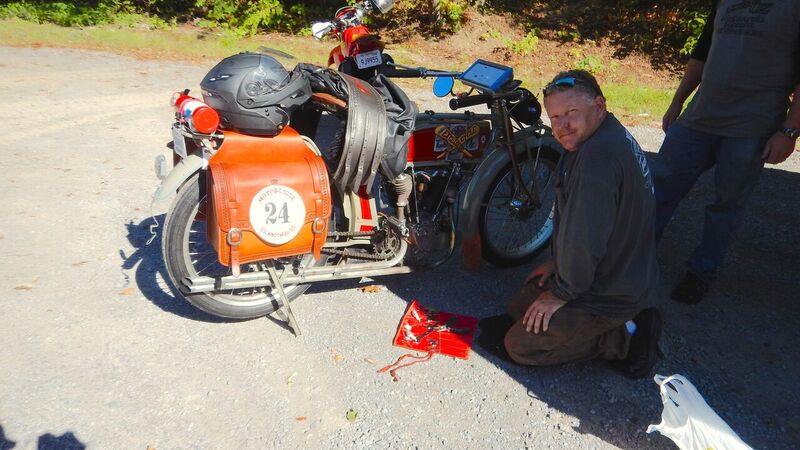 At mile marker #172 I found Vinnie Grasser of Florida, #95 with a broken chain. We moved to a section of the shoulder of the road that afforded some much desired shade. He had just fixed the chain one mile earlier and he was hoping to find another master link in his bag of tools. Sure enough, he found one that worked. As we sat on the road chatting, two locals walked up to us with a bottle of water and two cans of soda pop. They stayed to talk and were delighted to have stumbled upon something so unique. We watched Vinnie ride off and we chatted a few more minutes before I took to the road again. I wanted to give Vinnie a head start in case that chain came off again. He was doing just fine when I passed him a few miles down the road. 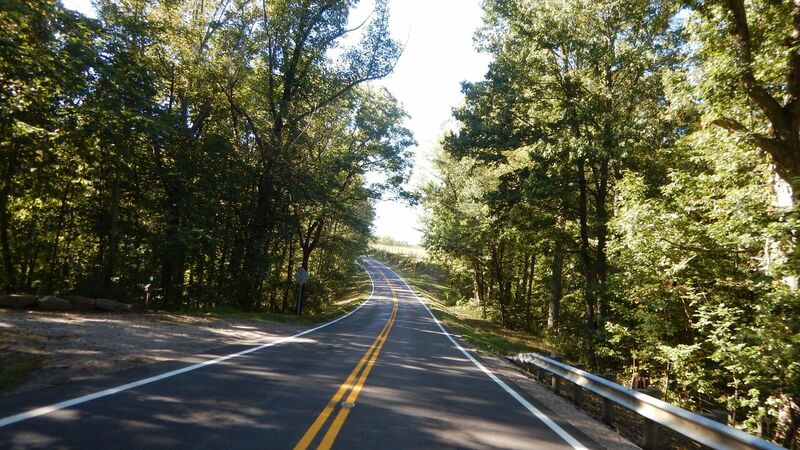 The newly blacktopped Highway 56 guided us through Ohio, winding through Coonsville, before depositing us at our landing spot in Chillicothe. Another day, another night of relaxation for some and late hours in the parking lot, wrench in hand, for others.